Storytime magazine has been open for story submissions for a while now and, as a result, I’ve read hundreds of short stories crafted by writers around the world. Over the last few months, I’ve got a much clearer idea of what works for Storytime and I’ve been jotting down tips and advice for short story writers as I go along. 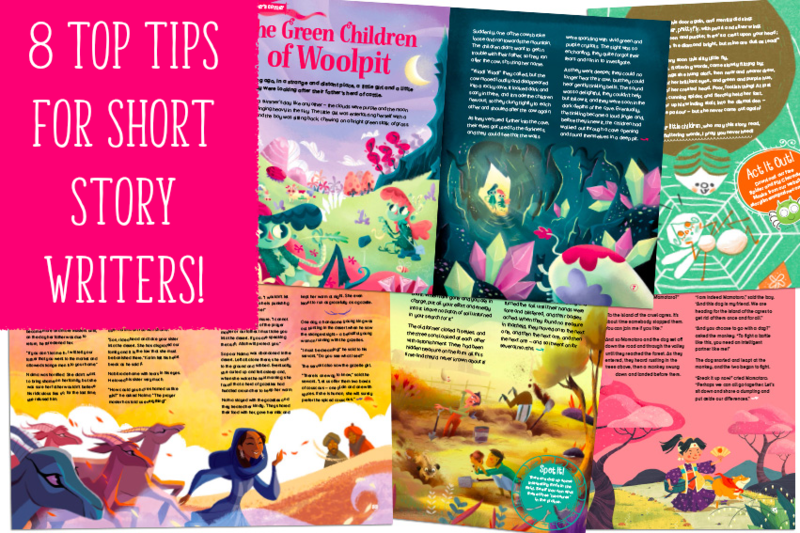 If you would like to get your children’s stories published, then I humbly offer these beginner’s tips in the hope that they will help you. Read on! 1. All of the stories have silliness, humour or wit, sometimes warm and gentle wit. They made us laugh or smile. 2. Five of the stories feature friendship and kindness. 3. Four of the stories celebrate childhood imagination and creativity. 4. Three of the stories feature surprises or follow an unexpected path. 5. All of the stories feature characters, setting descriptions or scenes that I instantly knew would look great in illustrations. Of course, we don’t want every story we ever publish to have all of the themes above, but I do believe that humour in stories has enduring appeal for children – and plays an important role in keeping kids engaged and reading for pleasure. And stories that children can personally relate to (because they act and imagine or feel and behave exactly the same way as the character in the story) have real value too. So taking the above story types and themes into account and bearing in mind the many submissions I’ve read in recent months, here are some Dos and Don’ts for hopeful Storytime contributors. 1. Do think visually. You don’t have to be an illustrator to do this. When you’re writing your story, creating its characters and planning the ‘action’ scenes, you will naturally work out and express what it looks like in your writing, so considering how or whether that will work as illustrations in Storytime magazine isn’t a huge leap. An example: we got a story about a baby animal desperate to grow up and be like its father, a stallion. It was told from the perspective of the baby and featured amusing scenes with the baby attempting (but failing) to be taller, which would have looked great. It was well written and I could sense an interesting ending was coming. The baby animal was a kitten – it would never grow up to be a big horse. A lovely idea, but it would have been incredibly hard for us to illustrate several pages of fun attempts to be taller without ruining the big reveal at the end. It was a nice story that we simply couldn’t work with. Another quick point on this subject – don’t litter your writing with visual pointers and directions for illustrations. It makes it difficult to read, and we’re happy to discuss this at a later date if necessary. 2. Do think like a child. Sure, stories can teach valuable lessons and grown-up wisdoms, but they can also speak directly to kids about their experiences – the stuff that makes them frightened or nervous or annoyed or happy or excited. The stuff that makes them tick. There’s no better way to learn this than to spend time with kids and be a big kid yourself. One of the stories we’re publishing next year was written by a dad for his son’s bedtime story and was inspired by his son. 3. Do write a proper story with a proper ending. Quite a few of the stories we get in aren’t fully rounded. Either nothing actually happens or they fizzle out. A short story, like any story, demands a beginning, a middle and an end. Something interesting, challenging or exciting needs to happen to the characters and there needs to be a resolution. 500 to 750 words might seem a challenge, but by writing a captivating story of this length, you are doing a great service to tired parents and children everywhere – you’re giving them a bedtime story they can make time for. 4. Do pay attention to the guidelines. Sorry, but I can’t read stories below 500 words, over 750 words, written in verse, or with illustrations or photographs, because it’s just not what we’re looking for. 5. Don’t be too local. We publish in the UK, but we have subscribers all over the world, therefore, we do our best to feel global. Some of the stories we get in from US writers, for example, are so exclusively American in their references, particularly to food, activities and sport, that they just wouldn’t work for readers outside the US. For a truly great story, I will always try to get around it, but it’s good to think globally in the first place. 6. Don’t be too schmaltzy. Family, friendship and kindness are all subjects that work for children and we welcome them in Storytime magazine, but we do prefer warm-hearted content of this nature to be delivered in way that isn’t excessively saccharine or sentimental, otherwise it can feel a little condescending to children – and to parents too. Tempering emotion with a bit of light humour or raw honesty can help. 7. Don’t end with a dream. I’ve put this in purely because we’ve had so many “and it had all been a dream!” endings in our submissions. To the reader, that feels like being cheated. Dreams are great sources of inspiration, but shouldn’t be used as an excuse for an exciting or surreal setting. Perhaps that stopped being a great idea after Lewis Carroll nailed it. 8. Don’t be different for the sake of it. We often get stories in where animals have a wacky colour or characters have a quirky, over-the-top name – and that difference bears no relation to the rest of the story. Often, it isn’t mentioned again beyond the first sentence or title of the story and it doesn’t add to the story in any way. If you’re going to give your character an interesting, unique quality or name, think about why you’re doing it and what that can bring to your story. Is it a source of conflict, confusion, humour, emotion? Does it form the basis of your story, drive it along or tell us something about the character’s personality? If not, why bother? Oh, and one more, please don’t ever be sexist, racist or any other outdated -ist in your stories. It’s important to us at Storytime that all humans are treated with respect, fairness and equality. Read about how we feel about diversity here. Some of these tips might seem obvious, but I’m writing them in direct response to the submissions we’ve had to date. As more submissions flow in and I research more and more previously published short stories for children, I’m building a clearer picture of how the art of short story writing works – and it is an art. In time, I hope to put together some more specific, constructive and helpful guidelines with more insights and examples of what works and why (and what doesn’t work so well). In the meantime, I hope that these 8 tips for short story writers can offer some guidance. Do remember, though, that every magazine is different. Every publisher has its own unique requirements and every editor has his or her own taste. I can’t speak for the publishing world as a whole but, for now, I know what works for Storytime. If you’d like to submit a story, do read the guidelines here! And please do read Storytime – it’s the only way you’ll ever truly understand what we’re about. I wish you the very best of luck – enjoy the process and keep at it!